The potential labour implications of industrial greenhouse gas mitigation are significant, particularly in the electricity generation and oil and gas extraction sectors. In 2030, up to an additional 27 thousand full-time equivalent highly qualified personnel (HQP) positions will be required in order to achieve Canada’s greenhouse gas targets. Every $1 million of industrial investment in mitigation produces between 3.0 and 4.4 person-years of HQP demand on average. In this Research Brief, Jacqueline Sharp and Noel Melton present the results of a study for Carbon Management Canada that investigated how Canadian greenhouse gas emission constraints are likely to impact industrial demand for skilled labour. Skilled labour shortages have already been identified in several sectors, including electricity generation and oil and gas. Industrial greenhouse gas mitigation efforts on a scale sufficient to make progress toward meeting Canada’s emission targets will boost labour demand substantially, exacerbating existing skill shortages. 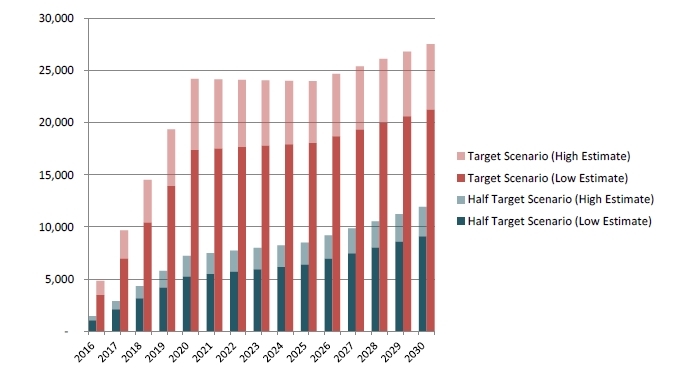 This figure shows the forecast additional demand for highly qualified personnel in two GHG reduction scenarios for Canada. In 2030, up to an additional 27 thousand full-time equivalent positions will be required. Download our two page research brief. Download the full research brief.